February 26, 2014 By Tina M 8 Comments This post may contain affiliate links. Read my disclosure policy here. Confession: I have never enjoyed grocery shopping. I just don’t like it very much. I enjoy making meals, but the whole process of planning the meals and shopping for everything has always been my least favorites on my “to-do” list. Now I have two children and grocery shopping has become even less desirable. Occasionally when I really lack motivation for it, my husband comes along to make the experience less painful. This weekend was one of those times. Since there were two of us, we let our 2-year old push one of those “little kid” carts. This is something I have never been brave enough to try. But I was surprised at how good she was. Granted, we had to keep her from running people over numerous times (which would be hard if I were solo), but I learned that she really enjoys helping me pick things out and put them in the cart. We had absolutely no whining the entire time which was an absolute miracle. 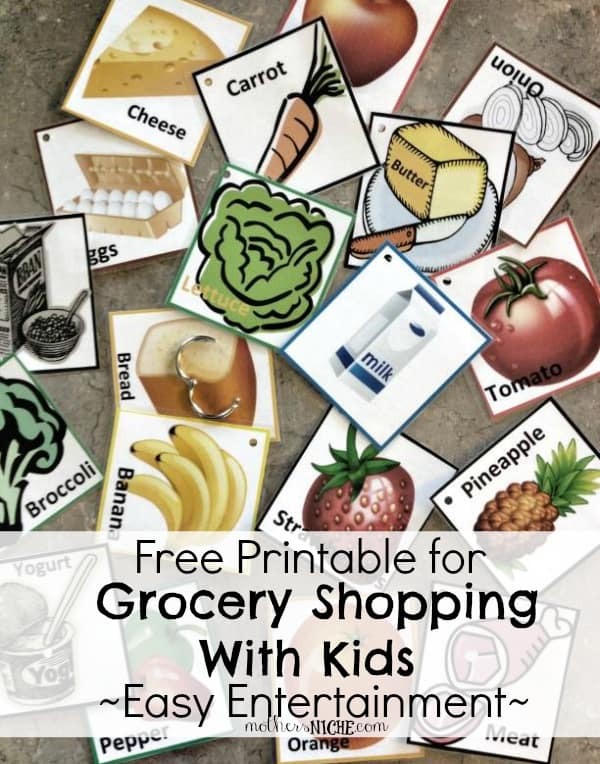 So I came home inspired to make a printable that would make grocery shopping more fun for the kids, as well as keep them distracted from whining. I always think it’s a good idea to let your children know ahead of time that they get to pick something out of their very own. If you are against treats, this could be a fruit or a yogurt, or whatever…just something to CLAIM. My daughter walks around the house all day “claiming” things (“mommy, this is mine”), and letting her pick something out seems to be important for her independence. Find items on your grocery list that correspond with some of the cards. Put them on a book ring (so they don’t get dropped and scattered) and tell your child they are in charge of finding those items specifically. *If you don’t have time to cut these out or you don’t have a laminator, you could always find some food flash cards, but I highly recommend owning your own laminator since you can get a good one for $20-30. Hope this helped someone out there! Keep Calm and Shop On!!! Speaking of grocery shopping, a blogging friend and role model of mine (Melea from Freebies2Deals) just recently published a BOOK! If you have ever wanted to get into couponing, this book has a lot of great info for you! And even if you don’t, there are quite a few chapters that don’t have anything to do with coupons. I hate couponing (I got burned out several years ago…it’s just not for me) but I personally benefited from the section on getting out of debt, and also saving money on vacation. We have already started out 10% Family Fun Fund and we are really excited about it! What do you do to keep your sanity while grocery shopping? « 2-Ingredient Pizza Dough (in five minutes)! I love this! I could use all the help I can get with my kids in the grocery store. This is going to be lifesaving for a LOT of parents! Thanks for sharing! This is a GREAT Idea. I love the cute cards. I’m going to have to start this soon. My son just hit the I hate shopping stage and since I love to shop and shop with coupons I take a little bit longer than most at shopping. 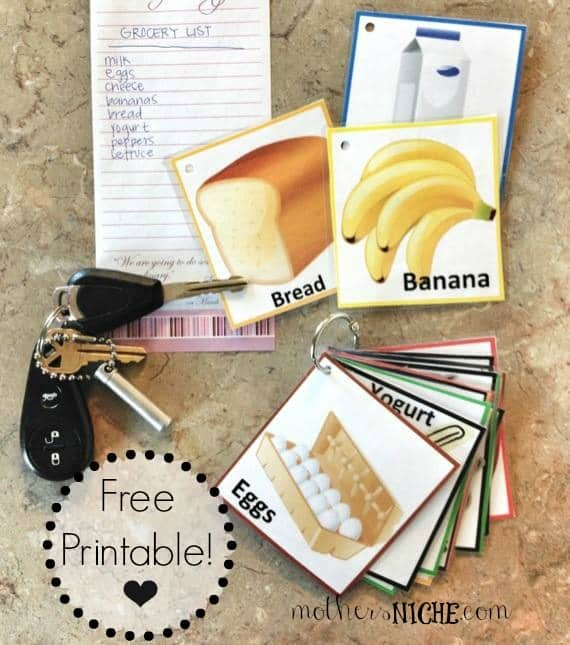 Great ideas, cute printables. Such a great idea~! Thanks for sharing the printable. I’m going to use these in my English class here in Japan! I’m going to take my students to the grocery store down the street and paractice How much is…? Thank you!